We all look forward to spring, when the trees bud, the birds sing and the grasses are that beautiful, rich green. It’s a time when nature can help undo some of the damage that bad weather, low-quality forage—and yes, even less than perfect management techniques—may have inflicted on your herd. 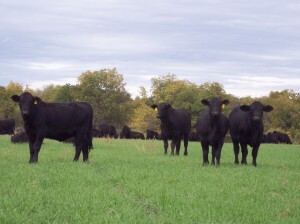 Spring pastures deliver the maximum levels of protein and energy, according to Ted Perry, Purina Animal NutritionBeef Nutritionist. While spring grasses are loaded with nutrients, a balanced mineral supplement should always be offered, he explained. When preparing cows for calving and rebreeding, there are clear benefits from utilizing as many of those spring grass nutrients as possible to increase body condition, especially in cows that have become thin over the winter. Rotational grazing is one method that helps us take advantage of the nutrients in spring grasses. If a farm is set up to accommodate this practice, moving cows through different pastures, he recommends allowing them to graze down to 3-4 inches before moving them to other pastures where grasses are 8-9 inches high. Forage analysis can also be helpful in determining mineral needs, Perry explained, but they only paint a “wide brush stroke”. You can’t rely on such analyses alone to prescribe exactly what’s needed. Approximately 40 percent of cows in the United States never get any supplemental minerals, according to Perry. And, minerals are key to a cow’s production efficiency, both in terms of feed efficiency and milk production. Purina Animal Nutrition offers more than 100 different formulations of minerals that target different seasons, different forage and pasture types and different weather patterns. The Wind & Rain® Storm® minerals have been specially formulated for consistent, predictable intake and also resist losses due to wind, rain and even storms. Talk to us all the mineral supplement options available to you and how we can help you choose the mineral program that’s right for your operation at any given time of year. This entry was posted on Monday, April 7th, 2014 at 1:30 pm	and is filed under News & Updates. You can follow any responses to this entry through the RSS 2.0 feed. Both comments and pings are currently closed.